German rabbi; born at Witzenhausen, Hesse-Nassau, Nov. 21, 1834; educated in his native town, in Hanover, at the Jewish Theological Seminary of Breslau (rabbi, 1859), and at the University of Berlin (Ph.D. 1860). He was successively rabbi at Lyck, East Prussia (1860-68); Buttenhausen, Württemberg (1868-74); and Mühringen (1874-84); since 1884 he has officiated at Wiesbaden. He was a member of the Württemberg assembly of delegates which met in 1869 for the purpose of drafting a new law for the Jewish communities of that kingdom. In 1882 he officiated at the funeral of the poet Berthold Auerbach (see "Worte am Grabe Berthold Auerbach's," Breslau, 1882). Of Silberstein's works the following may be mentioned: "Gelegenheitspredigten" (Breslau, 1870); "Moses Mendelssohn" (Esslingen, 1872); "Die Sociale Frage und die Mosaische Gesetzgebung" (ib. 1873); "Unsere Alliancen" (ib. 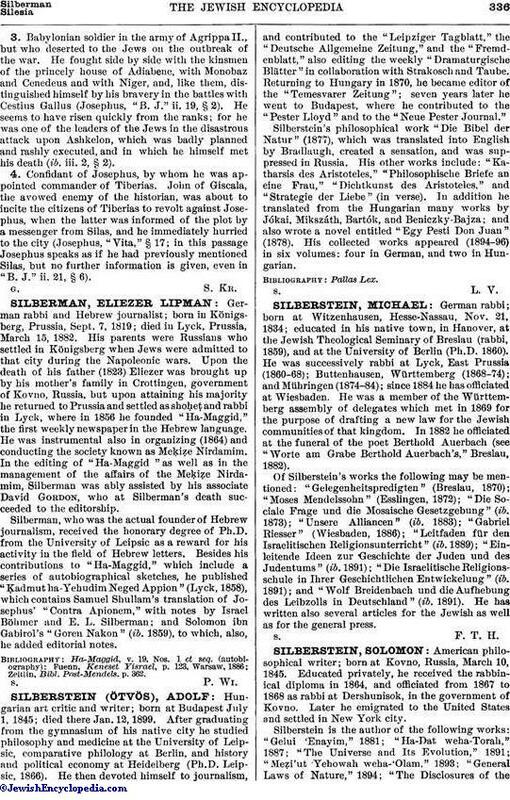 1883); "Gabriel Riesser" (Wiesbaden, 1886); "Leitfaden für den Israelitischen Religionsunterricht" (ib. 1889); "Einleitende Ideen zur Geschichte der Juden und des Judentums" (ib. 1891); "Die Israelitische Religionsschule in Ihrer Geschichtlichen Entwickelung" (ib. 1891); and "Wolf Breidenbach und die Aufhebung des Leibzolls in Deutschland" (ib. 1891). He has written also several articles for the Jewish as well as for the general press.